Why Do Footing Drains Clog? Footing drains clog up over time, even when a filter fabric has been installed to keep out finer particles. 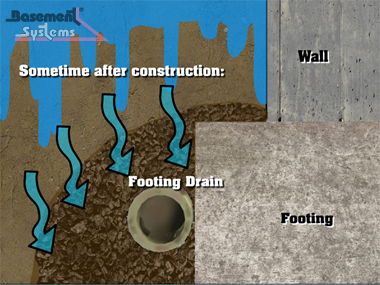 A common approach to draining water away from a foundation is the footing drain, which is installed when a house's foundation is first constructed. The footing drain rests just outside the foundation and most often consists of a thick pipe laid in a bed of loose gravel meant to serve as a sieve and keep dirt from entering but allowing water to pass through. Occasionally, filter fabric is placed around the pipe to keep finer particles of soil from entering the pipe. Footing Drains Have a Reputation for Clogging. While a footing drainage system can be effective for a time, eventually muddy water and particles enter the pipe and reach a tipping point. At this point, drainage is limited or completely obstructed. When excessive soil and debris press up against the filter fabric, this obstruction hinders the drainage process. Water in the soil around the foundation then finds its way through the smallest crevices and openings and into the basement. Fixing a Footing Drain is an Extensive, Short-Term Fix. To repair or change a foundation footing involves excavating the yard down to the base of the foundation, ripping out bushes or plantings near the house, and possibly the removal of steps, portions of a porch or deck or any other structure close to the foundation. After replacing or repairing the drainage pipe, the dug up soil is backfilled into place against the foundation and, once again, this soil is more loosely packed and more likely to absorb water the next time it rains, stressing the footing drain. This can become a cyclical pattern of clogged drains and water seepage into the basement.